In order to facilitate the design and manufacturing of future heterodyne array receivers, we are developing a compact focal plane array in a modular receiver cartridge. The array is fully scalable, both in frequency and in the number of pixels. The concept of modular receiver cartridge inserts is being employed in several modern receiver designs (ALMA, ASTE). We are extending this concept from single pixel receivers to complete focal plane array inserts. As a protoype, we are developing a 345 GHz array receiver module with 9 pixels. After the first tests we will assemble a cryostat which can hold two submillimeter cartridges for the KOSMA 3m telescope. The frequency range chosen for the first prototype array (330-360 GHz) covers the J=3-2 transitions of carbon monoxide and its isotopes. From the Gornergrat site, this frequency band can be observed during almost all of the time in winter and also during good conditions in summer. It will enable us to greatly increase the progress in the large scale mapping projects that are being conducted at Gornergrat. Fig. 1: Mechanical concept of the array receiver cartridge. Not shown are the IF/DC cables and the cartridge support structure. Fig. 1 shows the opto-mechanical layout of the 345 GHz receiver cartridge. All the parts are mounted on the 300 K plate, which is the main mounting interface between the cartridge and the cryostat. The low temperature stages are heatsunk to the radiation shield and the coldhead, respectively. We will try to use the same scheme that has been employed by the ASTE and ALMA groups in their single pixel cartridge receivers. In this setup, the cartridges slide into a ring of copper fingers, which are pressed against the cartridge flange by a Nylon ring. A high contact pressure between the cartridge and the copper fingers is ensured by the fact that the Nylon ring shrinks much more strongly upon cooling than the metal parts. This design makes the receiver frontend cartridge very compact and modular. The top end of the cartridge is the monolithic optical subunit, which consists of a two-mirror collimator for each pixel (see below). The level below the collimator subunit contains the local oscillator distribution network and the mixers. The LO power distribution will take place in a layer of waveguide couplers between the array of collimating mirrors and the mixer blocks. 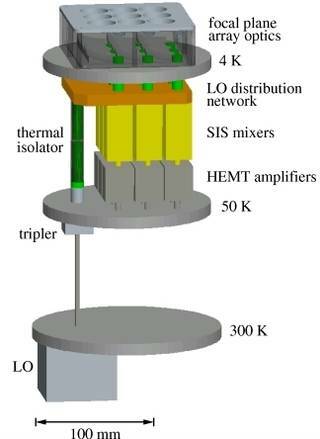 The HEMT amplifiers are located directly behind the mixers. The LO signal is fed into the cryostat by either a low thermal conductivity waveguide or a quasioptical coupling section. The LO unit itself sits on the outside of the receiver cartridge. One or more of the frequency multipliers of the LO chain may be located on the intermediate temperature radiation shield, if cooling of the multipliers is required. Fig. 2: 3x3 beam focal plane array optics (left) and optics unit-cell with the 3.25 w beam contour (right). Aside from the feedhorns the focal plane array optics consists of only three major parts: two plates with all the facet and illumination mirrors, respectively, and a spacer frame. Fig. 3: Photographs of the focal plane optics prototype of the new cartridge array receiver. The left hand panel shows the assembled unit, the right hand panel shows the inverted top plate with the individual ellipsoidal mirrors that shape the horn antennas output beams. The focal plane optics of the module matches the beams of the feedhorns to those required by the telescope. It is fully reflective, which avoids the absorption and reflection losses of dielectric lenses. The beams are arranged on a rectangular grid, with the feedhorns and small illumination mirrors located in the gaps between the individual beams. Thus, the array is scalable to an arbitrary number of beams. The optics unit-cell (Fig. 2 right) consists of the feedhorn (w0=1.8mm) and the elliptical illumination and facet mirrors (f=7.4 and 21.2mm, respectively). The reflection angles are 35 deg. As the illumination mirror is not quite located in the far-field of the feedhorn, the latter, a smooth-walled spline-profile feedhorn, is optimized to produce a Gaussian beam 22 mm in front of its aperture. In order to minimize the need for optical alignment, large optical sub-assemblies are machined monolithically, using CNC milling techniques. The focal plane optics consist therefore of only three parts: two plates with all the facet and illumination mirrors, respectively, and a spacer frame (Fig. 2 left, Fig. 3). Fig. 4: Measured 2D power pattern (left) and linear cuts along the x- and y-plane (right) of the center beam at 345 GHz, 100 mm in front of the array focal plane. Fig. 5: Mechanical concept of the cryostat. The indicated beam contour is the envelope of all nine beams at 345 GHz. The optics were designed and simulated with a physical optics software and have been measured in amplitude and phase with a scanning vector network analyzer at the University of Bern. The measured co-polar power pattern of the center beam at 345 GHz is shown in Fig. 4. We find w_0=7.0 mm. The beam separation is thus 3.6 w_0, which translates into 2.3 HPBW on the sky. The opto-mechanical concept of the cryostat is shown in Fig. 5. We plan to build a rotating dewar, which allows to introduce image (de-)rotation without introducing additional optics. By rotating the cryostat, the mixer arrays can be imaged to any position angle in the focal plane of the telescope. In this way we can also compensate for the focal plane image rotation introduced, when tracking an astronomical source with an alt-az mounted telescope. This scheme has been employed successfully on the CHAMP receiver built at the MPIfR Bonn. The cryostat uses a closed cycle refrigerator (Sumitomo SRDK415) equipped with a helium pot to dampen the thermal oscillations and with a vibration damping collar to dampen the mechanical oscillation. 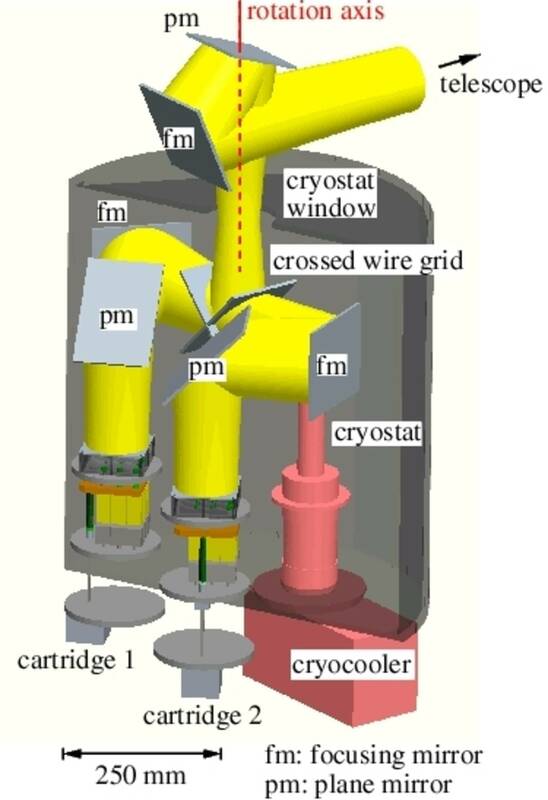 The refrigerator is located in the center of the cryostat and gets connected to the receiver ports with flexible heat straps. Two identical receiver ports will be available, one for each polarization. The telescope focal plane will be reimaged with a Gaussian telescope to match the cartridge's focal plane. A crossed wire grid polarizer at the entrance of the cryostat will distribute the two polarizations to the array receiver cartridges.